It took about half a day and the efforts of a small team and a forklift to move an F-35 Lightning II engine power module from its shipping container into the fuselage of a V-22 Osprey during a May 24 load demonstration at Naval Air Station Patuxent River, Maryland. From this demonstration, we expect that with improvements to loading processes and a future transport vehicle, a small team will be able to do what we did here today in about an hour and a half,” explained Todd Anderson, team lead for Naval Air Warfare Center Aircraft Division (NAWCAD) cargo and special operations team. With the first deployment of the F-35B scheduled for fiscal year 2018, planning is already underway to make room for the aircraft in the U.S. Navy’s supply chain. Of particular concern is the power module of the F-35 engine, which poses a significant logistical challenge to the Navy’s shore-to-ship link. While the H-53 heavy-lift helicopter can carry the power module by external lift 50 nautical miles or so, the Osprey, a tilt-rotor aircraft, can transport it up to 1,000 nautical miles. But the Navy must first load the component onto the aircraft, a complicated undertaking the Navy is still figuring out. Because of the component’s immense size and weight, many initially believed the part would have to be supplied to carriers by ship, but Anderson’s team showed in 2014 it could be supplied by carrier onboard delivery (COD). The difference in the speed of delivery is a matter of days. That year, they loaded and transported the power module on an Osprey to USS Wasp (LHD 1), using a prototype skid designed by Pratt & Whitney—the F-35 engine’s manufacturer—to keep the engine power module secure during transport by vehicle, as well as during flight inside the aircraft, where it was tied down in the fuselage. Altogether, the module and the skid weighed 9,350 pounds, so heavy the team had to make use of a rare trailer—only two are in existence—that was originally used to load 10,000 pounds of ballast at a time during flight tests for the CH-53K King Stallion. The 2014 load demonstration was not without some hitches, however. During the demonstration, the team of engineers and Marine Corps crew chiefs discovered the skid’s dimensions weren’t entirely compatible with the aircraft. 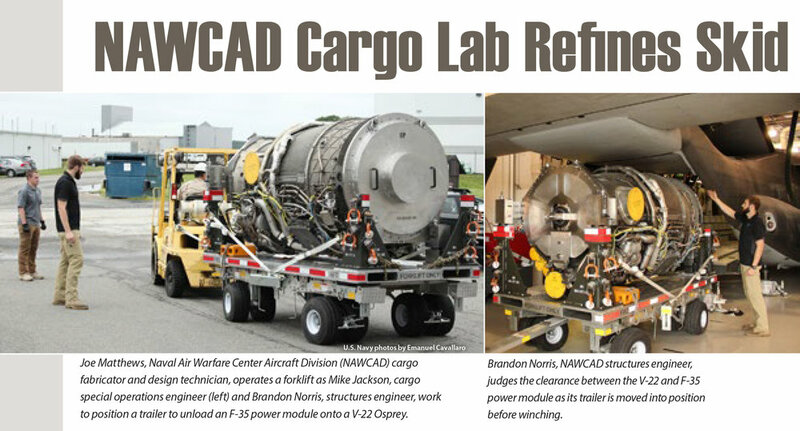 The May 24 demonstration at NAVAIR’s cargo lab was meant to improve and streamline the process. The team worked with Pratt & Whitney to fine-tune the skid, which is now 6 inches narrower, a half-inch shorter and reduced in length by 14 inches. The team also reduced the weight of the skid significantly, dropping the total weight of the module with the skid to approximately 7,100 pounds. Over the course of several hours, the team of engineers and Marine Corps crew chiefs lifted the module from its shipping container with a crane, dropped it onto the skid attached to a trailer, towed the trailer to the V-22’s cargo ramp, and then loaded the module and skid carefully into the Osprey and tied it down. Thanks to the demonstration and Anderson’s team working out the steps and determining the optimal dimensions of the equipment, the procedure will move much faster and require fewer people during future cargo operations. According to Anderson, the next step will be designing and constructing a loading device that can do what the trailer did—load the skid and module into the Osprey.